One of the things that most Christians desire is that their church grows to have many members. However, too often the emphasis is focused on growing the size of the congregation without considering the importance of the growth of each member. This is why it is important to have small groups where believers can regularly meet outside the local church for fellowship, ministry work, and study. 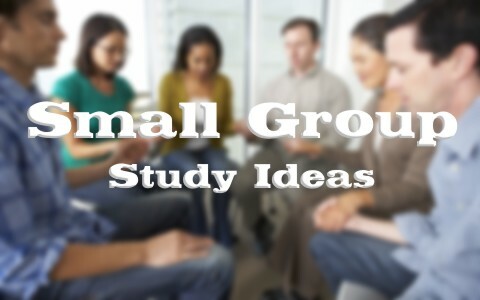 The following five small group study ideas are a good start when it comes to helping each other grow as believers and reach out to others. Does the Bible mention anything about believers meeting in small groups? The Bible does mention several instances where small groups met. The most direct reference is found in Acts 2:41-47 when the believers continued meeting at different homes to study, fellowship, and praise God. In Acts 10, a gentile named Cornelius believed that God existed and lived his life for God without knowing who God was. God sent an angel in a vision and told him to send men to Joppa to call upon Peter to come to Cornelius’ house. Cornelius did as he was told and sent two servants for Peter. When Peter arrived a few days later, Cornelius received him at his house where he had gathered with his unsaved friends and relatives. Peter preached the gospel at the house and everyone who heard him trusted Christ and were saved. We see another reference in Acts 12:1-17 when Peter was miraculously released from prison by the Lord. Peter immediately went to the house of Mary, the mother of John, where many believers had gathered to pray for him. We know they were praying for him because when he arrived at the door, the group did not believe a woman named Rhoda that told them he was at the door. The scene was somewhat comical in the description of how the group thought Rhoda was crazy because she essentially was reporting to them that their prayers for Peter were answered. There are more references to believers meeting in small groups such as the disciples in the upper room (Acts 1:1-12), but one thing is certain, small groups were common in Biblical times and the believers met for a variety of reasons. As we saw in the case of Cornelius, the groups met at his house to hear the gospel preached by Peter. In my experience in Christ-centered counseling, a very high percentage of people who call themselves Christians cannot verbalize a clear gospel message. Sadly, a large percentage of churches do not present the clear gospel message during the weekly services. Therefore, many people walk into a church destined to spend eternity in Hell and are never told what the Bible teaches about salvation. They walk right out of church still destined for Hell. A small group study on the clear gospel and presenting it is probably the most important study that can be done. There are many good small group studies on evangelism available. Some are very basic and some are quite extensive. Several years ago, I created a four-week evangelism study workbook called Sharing Our Savior (SOS) that teaches the nuts and bolts about salvation and how to present it to others. It included practice with each other on how to present the gospel so that each believer could confidently go out and share the gospel with others. As we saw in Acts 2:41-47, the believers continued what they were doing in church by going from house to house. Part of what they did was study the “Apostles doctrine” (Acts 2:42). In order to study doctrine, you must be familiar with what the Bible teaches about doctrine. This can be done by studying a book of the Bible or studying the doctrinal topics like the doctrine of angels, etc. For example, I have used the Bible Doctrines for Today book available from A Beka Book for small group studies. It is probably one of the best basic Bible doctrines books I have seen that covers much of what would be seen in a Bible College systematic theology course, but written at a High School level with lots of great diagrams. Knowing Bible doctrines helps to give a broader understanding of many important concepts taught in the Bible. As we saw in Acts 12:1-17, the believers gathered to pray for Peter when he was put into prison. Many believers today, are not familiar with how to pray at all or are afraid to pray out loud with or for other people. There are many good books that teach about prayer. Several that I have read are from Stormie Omartian, an author who, along with her husband, are known for producing books on prayer. A favorite of mine is a classic written by R.A. Torrey called The Power of Prayer and the Prayer of Power. There are many other good books on prayer that can be used in a small group that will help guide you through the scriptures so that consistent prayer by the believer becomes a part of their daily routine. In Acts 11:19-30 we learn of the efforts of Barnabas and Paul in training the believers at Antioch to become Christians, meaning like Christ. This is called discipleship, when believers are trained in numerous topics so that they establish Christ-centered lifestyles. Today, this would include teaching on how to study the Bible, Bible history, Old and New Testament Surveys, Bible doctrines, the life of Christ, and other studies that will help the believers to grow in their faith. Small group discipleship also includes time when the members can share their victories and challenges with one another in their heartfelt desire to live for Christ. There are several good discipleship study books. I wrote Grow Closer to Christ in Thirty Days: Daily Challenges to Increase your Faith with the intention of it being a personal study. However, I have learned that some people are using it for a weekly small group study over the course of 30 weeks, covering a day in the book each week. Likewise, the book, Changed into His Image by Jim Berg is another excellent book in both the adult and youth editions to use for small group studies. Probably the most overlooked area that can be used for small groups are studies on life skills. These groups meet with the purpose of inviting others to learn things such as job search skills, résumé prep, cooking healthy meals, parenting, and even some vocational courses in a Christ-centered setting. I encountered one group that invited people who were out of work to learn job search skills and network with local job recruiters. Many of the people who attended were unsaved, but came to trust Christ as their Savior because of the love and coaching of the believing group leaders. There are many experts in a variety of areas in every church that would not hesitate to give a series of presentations on their area of expertise. Small groups can be used to help people grow in their relationship with Christ and each other. The Bible mentions several instances where small groups met for Bible studies to pray and many other reasons. A small group study on the clear gospel and presenting is probably the most important study that can be done. However, there are many other studies that can be done in a small group that will help believers to become more like Christ and minister to others in a practical way.